Mr. Kalpesh Patel has entered the Real Estate industry in 1997 and since then has overseen the development of over 50 lac square feet comprising 16 Residential and Commercial Projects in Ahmedabad. 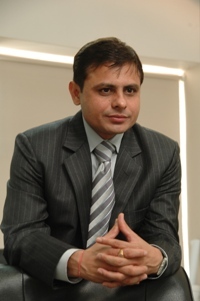 Kalpesh is also the Promoter and Managing Director with Shree Siddhi Group since 1997. He is associated as a Joint Venture partner with Godrej Garden City & Savvy Swaraj Sports Living both Marquee Projects of Ahmedabad. Ganesh Meridian & Ganesh Genesis are the recent upscale projects that have been executed under his leadership. His experience encompasses all the aspects Real Estate Development from Acquisition of land to execution of Projects. He firmly believes that by collaboration we can achieve more and sustain it.